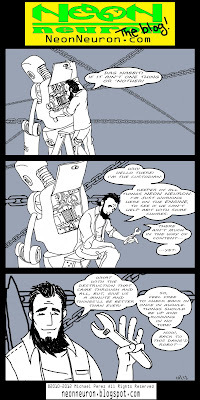 This comic was a test run for the NeonNeuron website. It was meant to be released while the website was under construction and help introduce everyone to Neuronaea (not to be confused with Neuronia). As you will see in the following posts, it was still in it's infancy and mostly an experiment in sequential narrative and character study. I attempted to release it on a weekly basis, but, due to time constraints I was unable to complete it in time for the launch of the website. At this point the main character was the Custodian. He is in charge of keeping the multiple universe in balance. 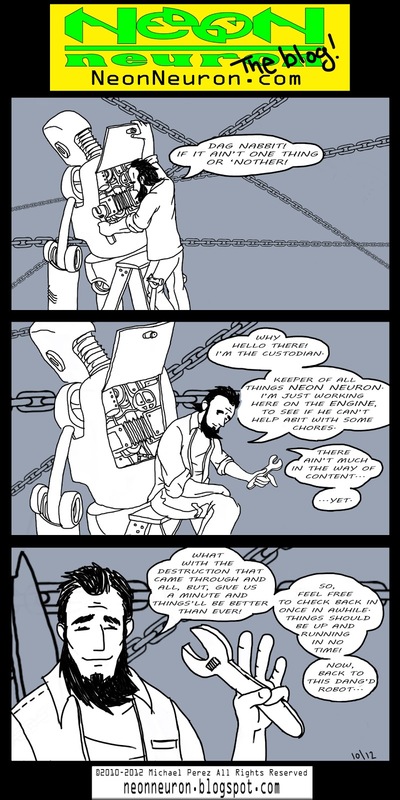 As the tale progressed and more comics were set be released, his story, as well as the stories of others in the Neuronaea, would unfold. Right now, it's all back on the drawing table for tweaking and refining. "Through the fire and the flames we carry on!"